DAVE was amazing, the guests were awed. I’d highly recommend him. A comedian for a ceremony was unexpected and funny. We could not have been happier with our experience with David! He was the officiant of our wedding in September and my husband and I were so impressed with his responsiveness to our emails! It was so nice meeting with him before hand so that he really got to know us before the ceremony! The ceremony was so personalized romantic and tastefully furnny our families were so impressed with him ! We would highly recommend him! Dave is hands down the best choice you'll make for wedding vendors. He was a terrific officiant and we owe him a lot. Our priest in the final week before our wedding cancelled!! Dave saved the day and really helped us out. My husband is very religious but ultimately even he was happier having Dave there than a priest. Everyone was so blown away with his humor and kind words. It was as if he knew us for a long time when he spoke. Everyone, just everyone, came up to us later and said who was he!? He was great!! I think they all thought he was a close, personal friend. I later found out to he helped my husband relax when getting my dress zippered delayed my arrival 45 minutes and he was starting to wonder if I changed my mind. =) The quick low down is he is great at communicating, booking is easy, payment is easy, the experience is terrific, he takes care of the paperwork, and it is all just so easy with Dave! Dave was amazing officiant, better than we could wish for. He was attentative and responsive. Sat down with us several times over two weeks to go over the process and helped us write and shape our ceremony. Multitude of guests commented about how great our officiant was. We highly recommend Dave's officiating services. Dave was a great guy to work with from beginning to the end. We were beyond stressed regarding the wedding and he made us feel very comfortable so we had one less thing to worry about. He is very professional at what he does while also keeping it fun and making you laugh. Everyone at our ceremony loved him and we highly recommend him as a wedding officiant. Incredible, caring and fun guy to be around. Choosing Dave to marry us was the best decision we had made. He took incredible care choosing his wording and working with us to make sure ceremonie was best possible. I wish I could get married a few more time and hire Dave. Incredible and hilarious wedding officiant! 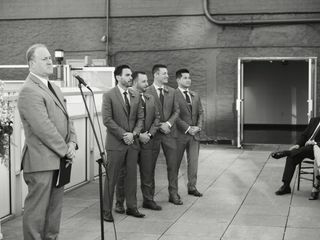 Dave was everything we wanted in our officiant and more! He made our guests laugh and did an outstanding job. Highly recommend! We can’t say enough about Dave. He came from NY to officiate our small VA mountain wedding. We were so nervous but Dave took our previous conversations and experiences and made the entire ceremony personal, warm, funny, loving and professional, all in the same moment. Our nervousness was gone. Our guests loved him and we have already recommended him to others. AND he does it all! He made wonderful suggestions during the planning phase, entertained the guests as they arrived, and oversaw so many details during and after the ceremony. We just couldn’t have chosen a better officiant. Thank you Dave for just being you. Dave is so professional with a taste of humor. All of my guests said the ceremony was beautiful and entertaining. I wanted a very happy ceremony and hearing my guests laugh here and there and also have a big smile on their face made my day. It also really set the tone of our wedding by having Dave put a smile on their face. I would 100% hire him again and refer him. You won't regret it! He's the best and is super professional. Even my bosses and major players in the corporate world loved it!! We scoured the NYC-officiant-interwebs so you don't have to: Dave is the absolute best. Flexible, fun, professional, personable - you name it. He made the most important day of our lives even more amazing. We now consider him a lifelong friend. All of our families and guests loved him too! Dave is a legend. With such short notice and within one phone call, we had our ceremony tailored to our needs. Giving us the opportunity to run ceremony drafts back and forth, Dave made sure that nothing was missed out. We couldn't have had a better experience - thank you Dave for making our day so special. We'd highly recommend him to be anyone's officiant - with his cracking sense of humour, everyone felt comfortable and the ceremony couldn't have gone any smoother. I went to college with Dave and immediately thought of him when my wife and I were talking about who would officiate our July 9th ceremony. He is a stand-up comedian by trade, but didn't overdo it, and let the humor happen as he told our story and watched as my brother and my wife's dear friend presented two readings before my groomsmen Tom read aloud and then sang while playing guitar The Ramone's "I Wanna Be Sedated." And without warn, Dave was later asked to offer a prayer at the reception. Telling people he was an officiant, not a priest, he offered the prayer in Hebrew and said Go Yankees. Dave is a great, funny, talented guy and a total professional and I would highly recommend him. Dave was absolutely wonderful - he pulled our wedding ceremony together. A few hiccups starting the music at the beginning of our ceremony could have caused a state of anxiety to grip the room, but Dave’s quick wits gracefully relieved the room’s tension and brought the focus back in. Dave’s exceptional ability to control the room and handle any unexpected circumstances are what made him essential for our wedding, and why we whole-heartedly recommend him for yours. Dave worked with us to create the ceremony that we wanted and were proud to share with our guests. He was completely amenable to our schedules and interests and took exceptional care in putting together a wonderful ceremony for us. 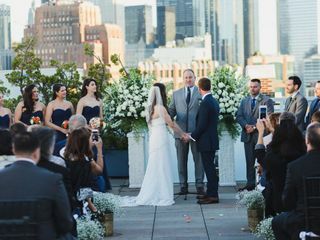 Many of our guests commented on how much they enjoyed the officiant, and were shocked to hear that he was so affordable in light of such high wedding expenses. 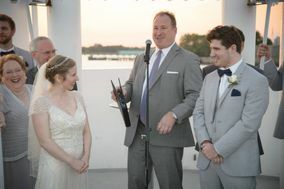 Dave is a true professional, and a perfect fit as a wedding officiant! Who has a comedian officiate their wedding???? We do!!!! What a fantastic and memorable to set your ceremony apart from all the others. My husband and I were both getting married for our second time and didn't want to go with the same old, same old. We met with Dave to tell him our story and we both felt immediately so comfortable with him that ALL the nitty, gritty details came out. Yes, we had to go back and say "you're not going to include THAT in the ceremony, are you?"...ha!! 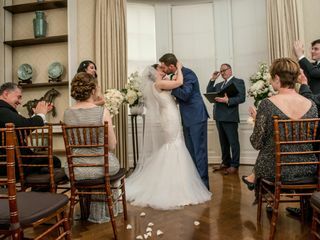 He assured us that he would keep the ceremony appropriate, which he did, while still including personal and funny stories that made our ceremony truly individualized and entertaining for both us and our guests. The ceremony felt like it was being officiated by a friend who had none both of us for years. Throughout the process, Dave quickly responded to any email I sent him. He gave me ideas for readings we could use and sent us drafts of the ceremony format. He didn't give me ALL the details of what he planned to say because he wanted it to be a surprise to us so our reactions would truly be genuine and spontaneous. He did not disappoint. 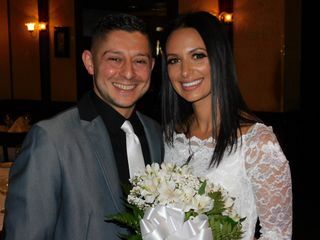 Dave was an awesome addition to our day and we got so many compliments from our family and friends about his ceremony. He brought our "story" to life and set our wedding apart from the others. I'd hire him again in a heartbeat!! Dave was the perfect officiant for our wedding. When we were putting our wedding together, I knew I wanted someone funny and genuinely nice to be a part of our day. I saw that Dave was a comedian, and as someone who used to do stand-up, I of course looked up a set to make sure he was in fact a funny dude - and he absolutely was. To top it off, we put together our wedding in a week, and luckily he was available. He was great with communication, took the time to meet with us and get to know us, and throughout the process he was great with checking in with ideas and edits and ultimately gave us a wonderful and personalized ceremony. My family had a great laugh and my mom even asked for his info to give to her friends. It was a perfectly fun sweet little ceremony, and Dave was exactly what we were looking for. 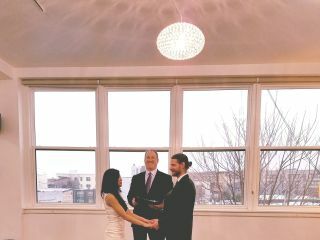 Super available via email and phone and gave us the exact ceremony we were hoping for...romantic yet funny and quick/to the point but long enough and heart felt! Dave is such a great guy. 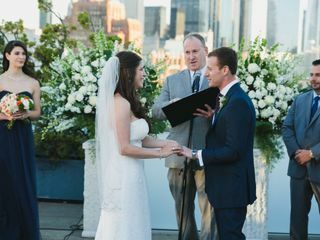 He officiated our wedding, which was a mixed Jewish- Hindu wedding, and he was happy to research whatever was needed to make it a meaningful experience for us. I really appreciate all the effort he made to give us the wedding we wanted and he did a great job, we had a lot of fun. Dave was amazing throughout the entire process of preparing for the wedding. We spoke over the phone for our initial interview and that was followed up with numerous emails, leading up to an in-person meeting where we talked about ourselves as a couple, and what we wanted for our ceremony. Dave did exactly what we wanted, and there were no surprises, and he was also so supportive throughout the process. He was prompt, professional, and also added some humor and light-heartedness to the ceremony. My husband and I highly recommend him - you will not be disappointed!! Dave Goldstein is the best! Not only is he flexible, and accommodating, he's also great about responding to any emails or phone calls. He's hilarious and heartwarming and the perfect officiant for any wedding! I found Dave on a random website, I'm not even sure how I found it. However, I saw that he was a comedian and that immediately struck my attention. Dave was so great from the start, he skyped with my fiancé and I and got to know us a bit, then from there he was super attentive to e-mails and answering any questions that we had. Come ceremony time his speech was perfection, short, sweet and a bit funny ( not cheesy at all!). After the ceremony we got so many compliments about him! I would recommend Dave to anyone wanting a unique, fun, and a bit funny wedding ceremony to remember forever!